Tech Sector Update Cory and Taylor. 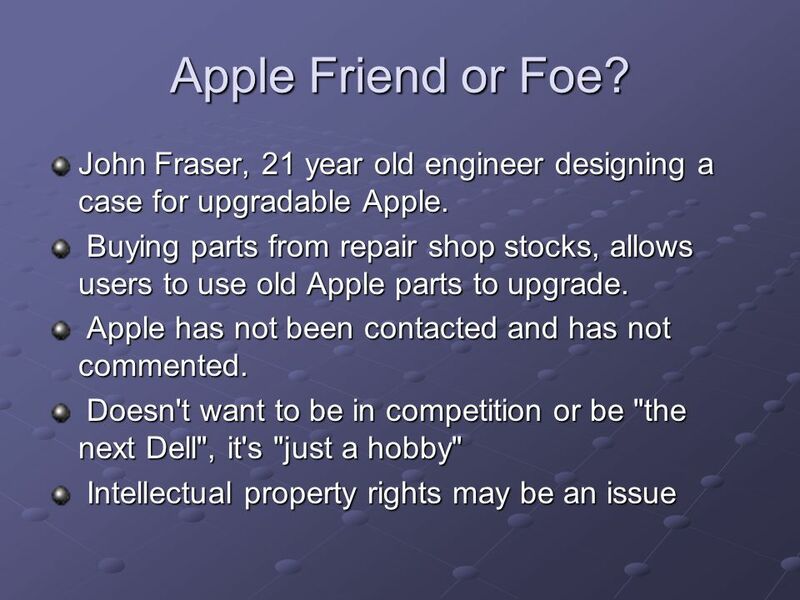 Apple Corp. (AAPL) Sales falling short on high end machines, large customer boycott because fans were too noisy. Typically. 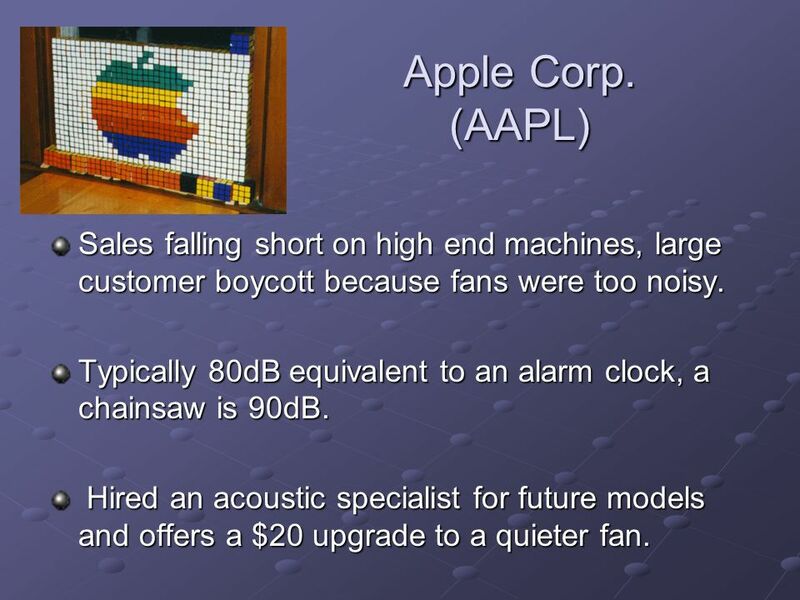 2 Apple Corp. (AAPL) Sales falling short on high end machines, large customer boycott because fans were too noisy. Typically 80dB equivalent to an alarm clock, a chainsaw is 90dB. Hired an acoustic specialist for future models and offers a $20 upgrade to a quieter fan. Hired an acoustic specialist for future models and offers a $20 upgrade to a quieter fan. 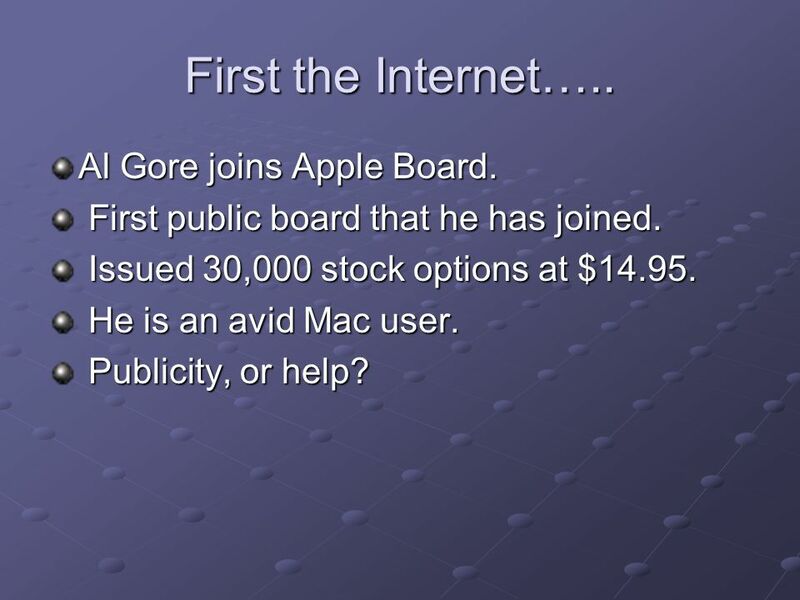 4 First the Internet….. Al Gore joins Apple Board. First public board that he has joined. First public board that he has joined. Issued 30,000 stock options at $14.95. Issued 30,000 stock options at $14.95. He is an avid Mac user. He is an avid Mac user. Publicity, or help? Publicity, or help? 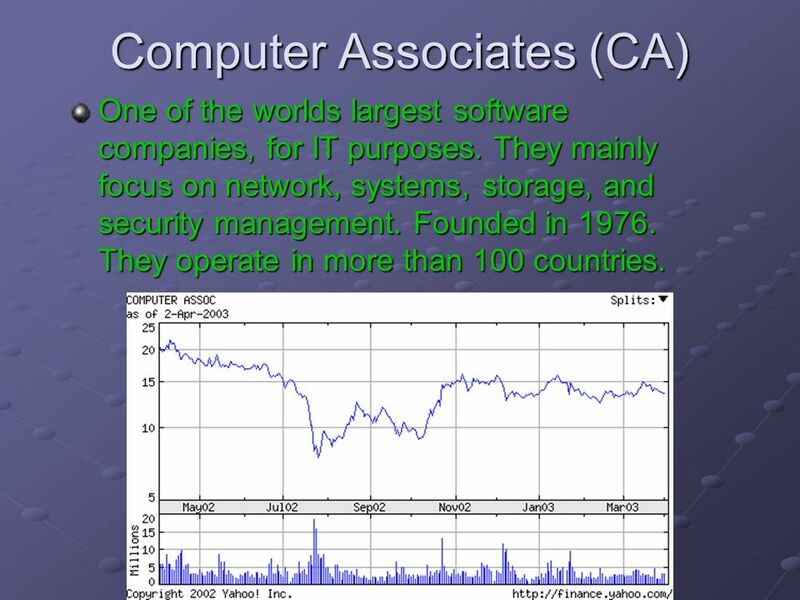 5 Computer Associates (CA) One of the worlds largest software companies, for IT purposes. 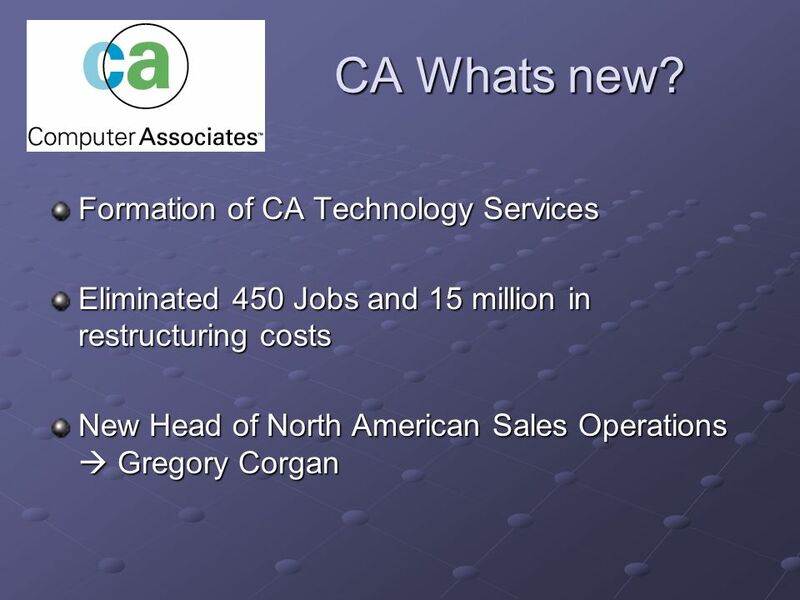 They mainly focus on network, systems, storage, and security management. Founded in 1976. They operate in more than 100 countries. 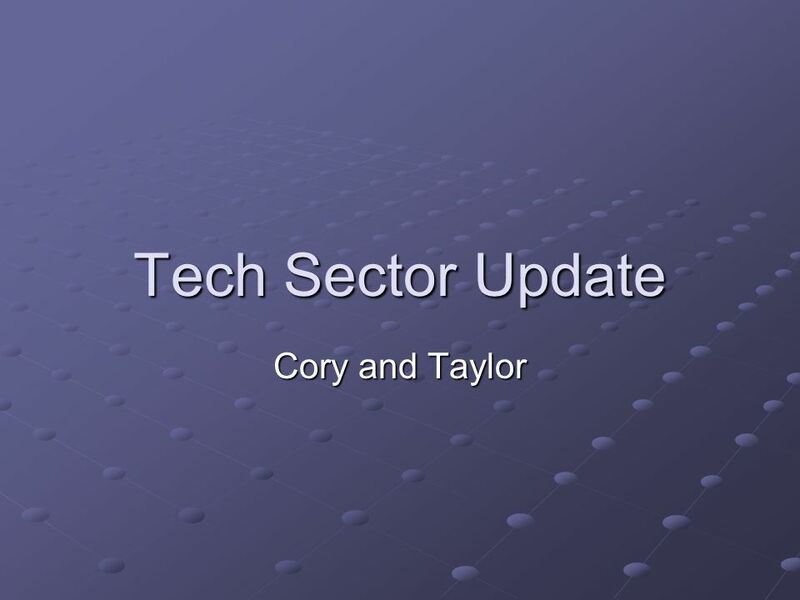 Download ppt "Tech Sector Update Cory and Taylor. Apple Corp. (AAPL) Sales falling short on high end machines, large customer boycott because fans were too noisy. Typically." BUY ONE, GET ONE FREE! BUY THREE PRODUCTS, GET THE THIRD FREE!! TRIPLE POINTS THIS WEEK-END ONLY!!! Whats our favourite??? Why Buy an ATM? This is a brief presentation that illustrates how placing an ATM in a retail location has multiple layers of benefits, not just in terms. Social Media –General Overview. Social media is..
ATS 5A - 1 The Art of Tech Support John Abbott College How to Work with Vendor Support M. E. Kabay, PhD, CISSP Director of Education, NCSA President, JINBU. Usage-Based DHCP Lease- Time Optmization Manas Khadilkar, Nick Feamster, Russ Clark, Matt Sanders Georgia Tech. Copyright © 2012, Oracle and/or its affiliates. All rights reserved. 1 The following is intended to outline our general product direction. It is intended. ETD Preservation Workshop Session One: ETDs and Preservation Needs Gail McMillan, Virginia Tech. 1 Class problem Look-N-Cook sells uncooked pies that can be heated at home and taste delicious. An income statement for a typical month is given below.